This article focuses on the issues regarding the city transport. The significance of city transport in Poland from 2014 to 2016 is discussed, including the demand for this type of travel in various regions of the country. The means of transport and transport infrastructure used to meet the society’s needs in terms of moving about the city and the suburban areas is characterized. The quality of services offered by the city’s transport operators in Krakow is also examined as well as their fleet vehicles and ticket prices. Furthermore, passengers’ opinions about this form of travelling short distances are included. Bąk-Gajda D., Bąk J., Psychologia transportu i bezpieczeństwa ruchu drogowego. Wyd. Difin, Warszawa 2010. Chamier-Gliszczyński N., Modelowanie mobilności w aspekcie planowania transportu miejskiego. Wyd. Uczelniane Politechniki Koszalińskiej, Koszalin 2017. GUS. Wyniki działalności transportowej w latach 2014-2016.
w Krakowie. Praca dyplomowa Politechniki Rzeszowskiej (promotor: Edyta Zielińska), Rzeszów 2018. Lejda K., Mądziel M., Siedlecka S., Zielińska E.: The future of public transport in light of solutions for sustainable transport development. Scientific Journal of Silesian University of Technology. Series Transport. Zeszyty Naukowe Politechniki Śląskiej. 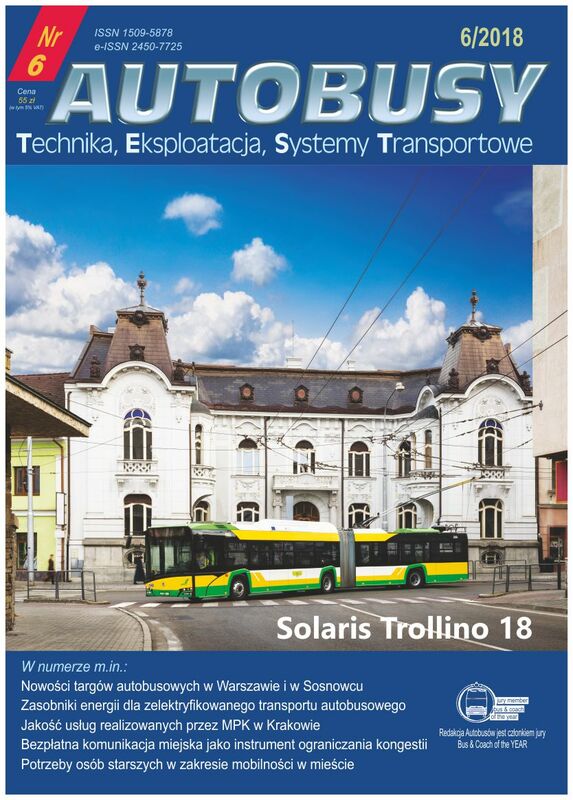 Seria Transport Volume 95/2017.